Let's Go On An Egg Hunt! [G1940] - $12.00 : Yarn Tree, Your wholesale source for cross stitch supplies. 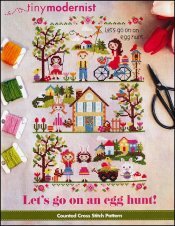 Shopping Cart Home :: Cross Stitch PATTERNS :: Tiny Modernist :: Other :: Let's Go On An Egg Hunt! Cross stitch pattern from Tiny Modernist. Look at this adorable Easter design! Kids are outside swinging, flying a kite, riding a bike, looking for Easter eggs, etc. It's a beautiful spring day with the birds chirping and the sun shining brightly. Stitch count 100w x 159h.